Women are by no means absent from UCL Special Collections’ archives, records, manuscripts and rare books, but it is not unfair or exaggerated to say that overall our collections are heavily dominated by men – by and large they were first collected by men, containing works created by men, that were quite often produced for men, too. For International Women’s Day this year, we’ve been tweeting about some of the women featured in our collections. A complete guide to all the women who sit on our shelves is a pipe dream for the moment, but we can at least celebrate some of the women whose lives and works have captured our attention! Grace Aguilar, novelist, poet, and writer on Jewish history and religion. Spare Rib, the Women’s Lib magazine we hold in our Little Magazines collection. The British Library has digitised their archives of Spare Rib. Biochemist Professor Patricia Clarke, who had a particular interest in ensuring more women became scientists, and had the same career prospects as men in the sciences. 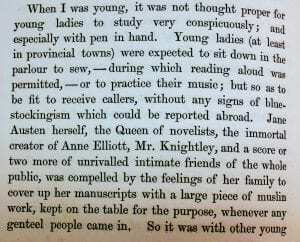 Harriet Martineau‘s reflections on female writers in the early 19th Century. Crystallographer Kathleen Lonsdale, the first woman tenured professor at UCL. The behind the scenes influence women have had on our collections, such as Helga Sharpe Hacker, whose donations to UCL included an important Byron manuscript. The National Union of Women Teacher‘s (NUWT) archive, a rich source of information on equality in teaching and a host of political campaigns in the first half of the 20th Century. Virginia Woolf, who with other women of the Bloomsbury group, makes a few brief but valuable appearances among our collections. 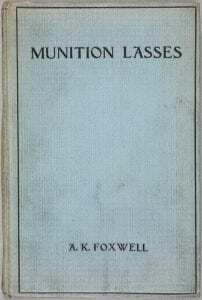 Agnes Kate Foxwell, a UCL graduate whose book Munition Lasses describes some of the dangerous but vital factory work undertaken by women during the First World War. Our work promoting the women on our shelves, and celebrating women’s suffrage, doesn’t stop at a few social media posts. Next term, we’re excited to be welcoming a visit from the Girls’ Network, and hope to be once again working with Newham Libraries to create a touring exhibition for the centenary of the Representation of the People Act. There’s our own ongoing exhibition, Dangers and Delusions, just one of the many Vote 100 events happening around UCL. We’re also more than a little curious to explore the many exhibitions and activities created and hosted by our colleagues at other organisations – like the National Trust’s Suffragette City, which just opened today.